President Trump spoke Monday at the American Farm Bureau Federation convention in New Orleans. 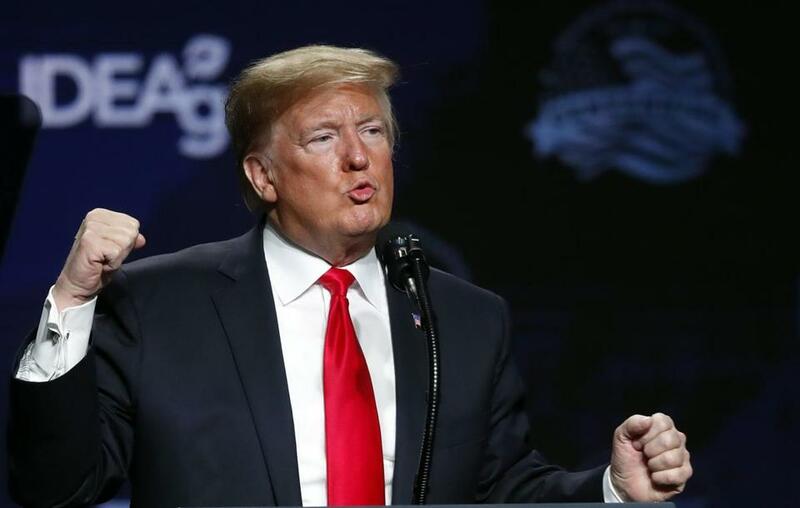 NEW ORLEANS — President Trump urged farmers Monday to stick with him even as many grapple with the impact of his trade war with China and the partial government shutdown. ‘‘No one understands better than our great farmers that the tough choices we make today reap rewards for centuries to come,’’ Trump said, adding that their ‘‘greatest harvest’’ is yet to come. ‘‘We’re doing trade deals that are going to get you so much business, you’re not even going to believe it,’’ he said. Trump, in an address to the 100th annual convention of the American Farm Bureau Federation, said the American heartland largely supported him in 2016 and pledged that his policies would ultimately help the agriculture industry despite short-term pain. The president devoted much of his hourlong address to defending his decision to hold out for billions of dollars to build his long-promised wall at the southern border, which has resulted in an impasse with Congress and the longest government shutdown in history. Trump said the wall was needed to cut down on illegal immigration, even though border crossings have fallen in recent years, and he said that it would lead to immigration reform that would help farmers get the workers they need for their fields. Despite Trump’s assurances, many farmers are feeling the pinch from his policies. The Agriculture Department, which is affected by the shutdown, is scrambling to blunt its impact on America’s farmers. Agriculture Secretary Sonny Perdue last week extended the deadline for growers hurt by Trump’s trade war with China to apply for federal aid meant to offset their losses. But some farmers will still have to wait until after the government reopens to see their checks. In addition, the Farm Service Agency, which distributes loans to farmers, has been shuttered since the first week of the shutdown. House Speaker Nancy Pelosi, in a statement, said Trump could help by signing a bipartisan bill passed by her Democratic-controlled House to reopen the Agriculture Department ‘‘instead of wasting farmers’ time with empty words.’’ The bill first must clear the Senate before it can get to Trump’s desk, and Senate Majority Leader Mitch McConnell, R-Ky., is refusing to bring up individual House-passed government funding bills for a vote. About 500 demonstrators marched outside the convention center to protest the president, some holding signs that said ‘‘Open the Government Now’’ and ‘‘Deport Trump.’’ But some farmers attending the convention said they continue to support Trump despite any difficulty they’re feeling. Richard Musel, of Bennington, Neb., a corn and soybean farmer, described business as ‘‘marginal’’ but said he doesn’t blame Trump. Musel said Trump has been good to farmers and had no choice but to get tough with China. He criticized Democrats for refusing to fund the wall. ‘‘He’s asking for such a small amount,’’ Musel said of the president. Lemuel and Shelby Ricks grow cotton, soybeans, wheat and peanuts on their farm in Conway, N.C. They said they've been hurt by low commodity prices and the shutdown. They can’t apply for financial aid the federal government is giving farmers hurt by Trump’s trade policies because of the shutdown. The Rickses said they voted for Trump and will again in 2020, contending the country will benefit from his policies in the long run. ‘‘We’re not giving up on him now,’’ Shelby Ricks said. Despite Trump’s lofty promises, there has been great unease in the agricultural community over the ongoing trade dispute with China. Retaliatory tariffs put in place by Beijing have slammed American farmers, many of whom were Trump supporters, and a federal government bailout to the industry has had limited impact. Moreover, despite a pledge to put ‘‘farmers first,’’ his new trade deal with Canada and Mexico, which is meant to replace the North American Free Trade Agreement, has yet to be approved by Congress and now potentially faces longer odds to win passage in the House.